Mathematics is a universal language and mathematics teachers are responsible for teaching this language. However, teachers generally ignore knowledge and skills of mathematical language and this may be explained by Bandura’s (1997) self-efficacy theory (Gray, 2004). The aim of this study was to investigate the effect of self-evaluation of pre-service elementary mathematics teachers on their self-efficacies with regard to language of mathematics by using the mixed method sequential explanatory design. The data was obtained with the developed instrument quantitatively in the first phase and qualitatively in the second phase. The results of the first phase indicated that there was no significant difference between pretest and posttest self-efficacy scores. On the other hand, the results of the second phase indicated that participants perceived the language of mathematics as using native language or using pedagogical approaches and they weren’t aware of the responsibility of teaching the language of mathematics besides mathematical concepts. Airasian, P. & Gullickson, A. (1997). Teacher self-evaluation tool kit. Thousand Oaks, California: Corwin Press. Bandura, A. (1997). Self-efficacy: The exercise of control. New York: Freeman. Bohen, D. B. (2000). How teacher candidates view and value the certification process of the National Board for Professional Teaching Standards. Viginia, USA: George Mason University. Covington, M. V. (1992). Making the grade: A self-worth perspective on motivation and School Reform. Cambridge, UK:Cambridge University Press. Cresswell, J. W. (2003). Research design: Qualitative, quantitative, and mixed methods approaches set (2nd ed.) Thousand Oaks, CA: Sage Publications. Cresswell, J. W., & Plano Clark, V. L. (2011). Designing and conducting mixed methods research. Thousand Oaks, CA:Sage Publications. Cresswell, J. W., Plano Clark, V. L., Gutmann, M. & Hanson, W. E. (2003). Advanced mixed methods designs. In A. Tashakkori & C. Teddlie (Eds. ), Handbook of mixed method research in the social and behavioral sciences (pp.209-240). Thousand Oaks, CA: Sage Publications. Esty, W. W. (2004/ unpublished manuscript). The language of mathematics. Finn, L. E. (2002). Using video to reflect on curriculum. Educational Leadership, 59(6), 72-74. Fraenkel, J. R., & Wallen, N. E. (1996). How to design and evaluate research in education (3rd ed.). New York: McGraw-Hill. Frederiksen, J. R., Sipusic, M., Sherin, M., & Wolfe, E. W. (1998). Video portfolio assessment: Creating a framework for viewing the functions of teaching. Educational Assessment, 5(4), 225-297. Gist, M.E. & Mitchell, T.R. (1992). Self-efficacy: A theoretical analysis of its determinants and malleability. The Academy of Management Review, 17(2), 183-211. Gray, V. D. (2004). The language of mathematics: A functional definition and the development of an instrument to measure teacher perceived self-efficacy. Unpublished doctoral dissertation, Oregon State University, Oregon, USA. Hall, M. & Ponton, M. (2005). Mathematics self-efficacy of college freshman. Journal of Developmental Education, 28(3), 26-32. Jamison, R. E. (2000) Learning the language of mathematics. Language and Learning Across the Disciplines, 4, 45-54. Jöreskog, K. & Sörbom, D. (1993). Structural equation modeling with SIMPLIS command language. Chicago, IL: Scientific Sofware International Inc. Miles, M., & Huberman, M. (1994). An expanded sourcebook qualitative data analysis (2nd edition). California: Sage Publications. National Council of Teachers of Mathematics (2000). Principles and standards for school mathematics. Reston, V.A: Author. Owens, B. (2006). The language of mathematics: Mathematical terminology simplified for classroom use. Unpublished master’s thesis, East Tennessee State University, Tennessee, USA. Özgen, K. & Bindak, R. (2008). The development of self-efficacy scale for mathematics literacy. Kastamonu Eğitim Dergisi, 16(2), 517-528. Pimm, D. (1987). Speaking mathematically: Communication in mathematics classrooms. London: Routledge & Kegan Paul. Roth, K.J. & Chen, C. (2007). Teacher learning from video cases of science teaching: A conceptual framework. Proceedings of the Annual Meeting of the National Association for Research in Science Teaching. New Orleans, LA. April 18, 2007. Schunk, D. H., Pintrich, P. R. & Meece, J. L. (2008). Motivation in education: Theory, research, and applications. Upper Saddle River, NJ: Pearson Education. Sherin, M. & van Es, E. (2005). Using video to support teachers' ability to notice classroom interactions. Journal of Technology and Teacher Education, 13(3), 475-491. Tashakkori, A. & Teddlie, C. (1998). Mixed methodology: Combining qualitative and quantitative approaches. Thousand Oaks, CA: Sage Publications. Torkzadeh, G. & Dyke, Y. P. V. (2001). Development and validation of an internet self-efficacy scale. Behaviour & Information Technology, 20(4), 275-280. Zazkis, R. (2000). Using code-switching as a tool for learning mathematical language. For the Learning of Mathematics, 20(3), 38-43. ISNAD KABAEL, Tangül , YAYAN, Betül . "Effect of Self-Evaluation on Pre-service Mathematics Teachers’ Self-Efficacy in Language of Mathematics". 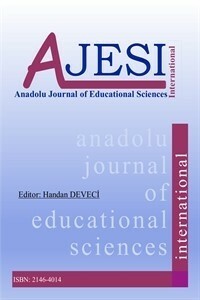 Anadolu Journal Of Educational Sciences International 7 / 1 (February 2017): 1-34.